December 5th, 1933 was the day that prohibition was repealed in the US. For our December nomad.event, we are marking the anniversary of this momentous occasion with some amazing cocktails, great live music and dancing. We have an incredible lineup of bartenders (from Knee High Stocking Co, Serafina, terra plata and Tavolata) who will be serving cocktails…the Careless Lovers (http://thecarelesslovers.com/) playing live music…Casey Schneider (from Century Ballroom) teaching the Charleston…Taylor Shellfish bringing oysters…and nomad.dinners providing other foods. Buy an entry ticket for $25 and when you arrive, you will receive 2 drink tickets and 2 food tickets (an extra drink ticket will be given to those who purchase in advance: nomadprohibition.brownpapertickets.com). Or, you can gain early entry and participate in a Charleston dance lesson for $15 more. Other price levels are available on the ticketing site as well. 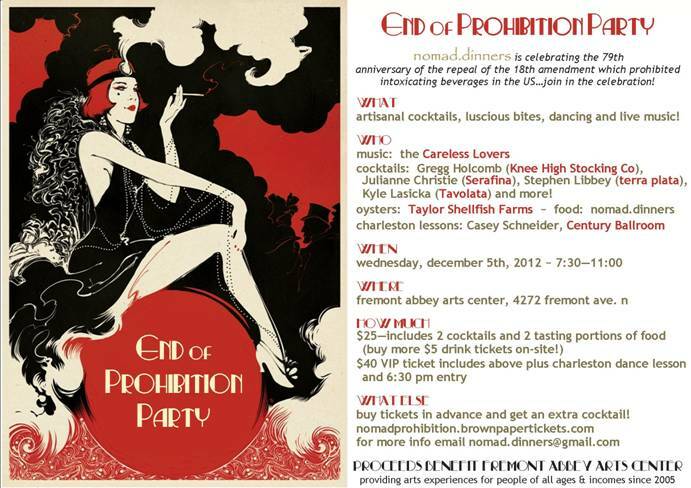 Proceeds from the event will benefit the Fremont Abbey Arts Center (http://fremontabbey.org/). The Fremont Abbey Arts Center’s (http://fremontabbey.org/) Mission is to curate vibrant & welcoming spaces where people of all ages and incomes can grow in their artistic & social development through arts & cultural experiences. Abbey Arts focuses on music, dance, visual, literary and culinary arts in formats including multi-arts performances, group classes & workshops, individual lessons, new exhibits, community gatherings, and artistic life celebrations.